In one of our first posts, we looked at how to become a commercial airline pilot. Medical clearance, proper training, and the necessary certification all come into play. But how does one go about earning their commercial pilot license specifically? Not just anyone can become a commercial pilot. For one thing, applicants must be at least 18 years old, literate in English, and hold a private pilot certificate. These aren’t the only prerequisites, though. A large number of applicants get turned down because of their lack of experience. 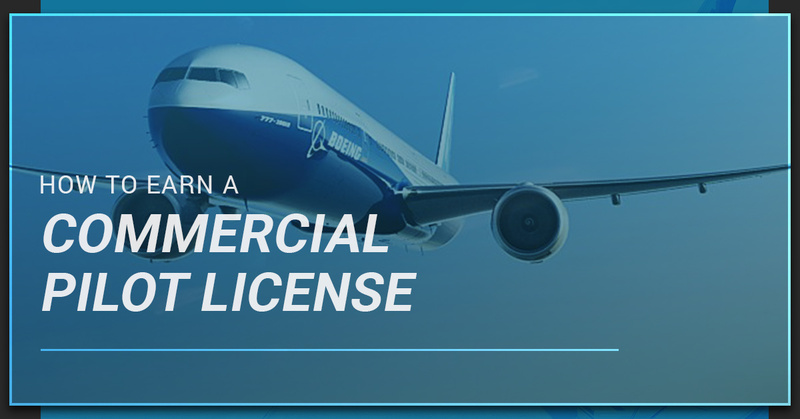 Keep in mind that a pilot needs at least 250 hours to earn their commercial license. So if you just recently started flying, don’t assume you can just make the jump to commercial flight courses. If you already have a private pilot certificate, you should also have what’s called an aviation medical certificate. Take some time to look over this important piece of documentation. If it’s a 3rd Class medical, just know you will need at least a 2nd Class medical certificate to move forward with commercial pilot training. As you might imagine, many aspiring commercial pilots gloss over this step. The last thing you want to do, though, is complete your training before finding out you can’t pass a 2nd Class medical exam. So make it a priority to get through the medical requirements before proceeding to the next step. Well, think of the FAA Written Exam as a valuable education resource (which it is) you will appreciate for years to come. Your sole focus can be on flying once you have passed this test. Now the real fun begins. Sure, you learned the basics during private pilot training. But commercial flight training is a whole different animal. Applicants should be prepared to learn new maneuvers, safety protocols, as well as how to fly cross-country flights. In order to earn a commercial pilot license, you must log 100 hours of pilot-in-command time and 50 hours of aforementioned cross-country flying. When it’s all said and done, you will also need to get, at the minimum, 10 hours of instrument training and 10 hours in a complex aircraft. We will explain how Alliance Aviation can help with commercial airline pilot training later in this post. You have officially entered the home stretch at this point. The initial tests are over with and you feel comfortable with the various commercial flight maneuvers. Now it’s time for the checkride. Think of the checkride as your final exam. This consists of several hours of groundwork for the verbal piece and a quick flight. During each step, the instructor will test to see what kind of commercial pilot you will be. Our advice for the checkride? Be precise, act professional, and relax. Maybe you’ve had a private pilot license for years. Without a doubt, aviation is your passion. Have you ever considered turning that passion into a career? When it comes to commercial aviation courses, Alliance Aviation has you covered. Our many flight training programs allow you to take the necessary steps in order to become a commercial pilot in the United States. Not to mention, the entire Alliance team is dedicated to your success. There’s never been a better time to seek accreditation from one of our flight training programs. At Alliance Aviation, we continue to train prospective and current pilots throughout North America. Our training locations today include Miami, Orlando, Fort Lauderdale, Dallas, Las Vegas, and Mexico. Earning a commercial pilot license is less intimidating than most people think. So then why not start the process at Alliance Aviation? We have programs to fit your needs.